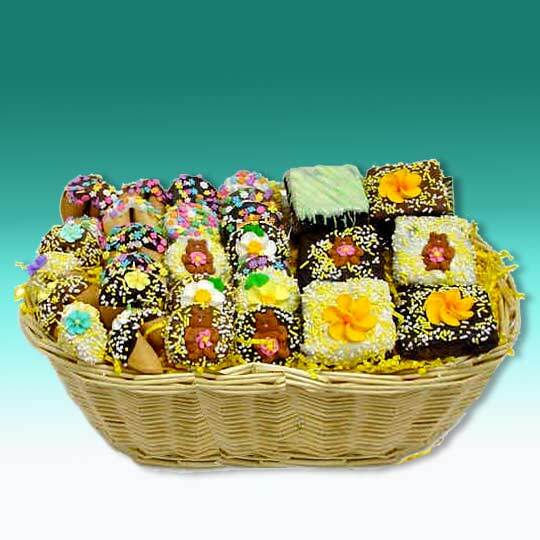 Our Springtime Sweets Gourmet Goodies Gift Basket is filled up with some of our most popular Belgian Chocolate and Caramel Hand Dipped treats.... Each one individually wrapped for freshness and decorated in springtime colors. Inside, they'll find a 1/2 dozen of our famous Triple Chocolate Gourmet Brownies -made with 3 times the amount of chocolate as regular brownies, these are extra-thick and moist and absolutely delightful! 1/2 dozen Belgian Chocolate Oreos®, and one dozen of our Spring Fortune Cookies, everything in this basket is dipped and decorated for Springtime with hand-crafted Royal Icing Edible Decorations- Sunny Daffodils and Teddy Bears with cute Spring Flowers, Candy Sprinkles and colorful Decorates!